Every predator angler will recognise the Fox Rage brand – after all, the company’s iconic Replicant lures have been seen around banks and boats for decades. 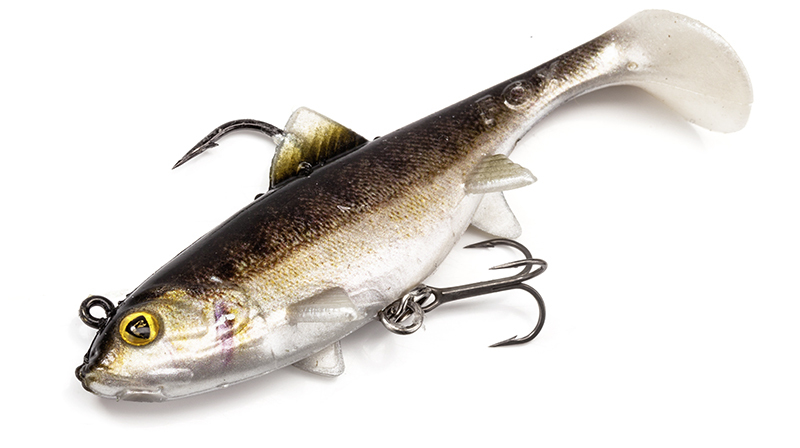 The lifelike, soft plastic swimbaits have caught countless large pike and zander here at home and all across Europe. The great news is that the latest Wobble, Shallow and Realistic Replicant models are better than ever, with more colour choices, more baitfish imitations and an improved ‘wounded’ movement in the water. Basically, if it has teeth and is of a predatory disposition, something in Replicant’s extended family will be mistaken for an easy meal. A innovative take on the original Replicant, the Shallow model takes lures into uncharted territory. With its balanced soft body and weighted harness arrangement, it can be worked just beneath the surface. Presented super-slowly, it has a hugely seductive swimming action. When a fish is hooked the harness detaches from the lure body, transferring the weight of the soft plastic away from the hookhold so the fish can’t use the mass of the lure to throw the hook. This also protects the lure from being damaged by the fish’s teeth. In 10 colour options, including the exciting Super Natural. This jointed swimbait will get you strikes when other lure types are struggling. In two sizes, it delivers a wide swimming, S-shaped action on the retrieve, which is all down to its segmented body design. The new generation of Wobbles comes In 10 colours, with the same belly hook rotation system as the Shallow. A large paddle tail creates loads of vibration. This brilliantly lifelike lure is based on the ultimate prey fish and uses Fox Rage’s new super-resistant lure material. A belly hook rotation system and high-end hooks make for a formidable combination when a fish hits. Three colour options (Super-Hot, Super Natural and Super Wounded) mean you can ring the changes to get predators interested. Pike eat pike, there’s no denying that, and that’s exactly what the Rage Realistic Pike Replicant takes advantage of. In 20cm and 25cm sizes, the lure is highly realistic in profile, while its large paddle tail delivers a thumping, rolling action that pike find almost impossible to ignore.